According to the notes Tribute invites ‘spiritual regeneration through music’ and if that sounds a bit wishy-washy, then I suggest listening in a more actively engaged way – the rewards are many. 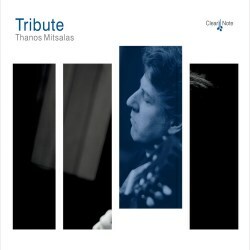 Thanos Mitsalas has constructed an attractive programme that reaches back as far as Llobet, includes two pieces by Rodrigo and some fine contemporary pieces that showcases the art of the guitar today. Llobet’s Variations on the Theme of Folias de Espana is something of a recital favourite, taking Sor’s Op 15 variations as its source material for the first two variations, adding eight further variations and an intermezzo. Full of fanciful wit and elegant roulades, with a positively charmingly played intermezzo, Mitsalas scores highly by virtue of his stylistic aplomb and deft articulation. He’s equally persuasive in Rodrigo – full of reflective and expressive refinement in Tiento Antiguo, a kind of impressionist tone poem, with its vihuela evocations prominent. Rodrigo explored Sevillian landscape in his much later Un tiempo fue Italica famosa, full of flair and flamenco exuberance as well as more lofty vistas, rich in poetic esprit. Tansman’s Variations on a theme of Scriabin dates from 1972 and alternates wistfulness and a more animated sense of drama, including meditative and fugato sections. Mitsalas has selected two movements from Piazzolla’s Cuatro Estaciones Porteñas and he brings out their evocative and lyric beauties with assurance. The Italian composer Simone Iannarelli has been living in Mexico for a number of years and his Tribute to Keith Jarrett is intended to show how the pianist has influenced Iannarelli’s music; consequently it doesn’t sound either like a reflection or pastiche of Jarrett’s music but something altogether more organic and stylistically tangential. Sergio Assad is widely admired as performer and composer and his generously appointed three-movement Sandy’s Portrait has a dancing Prelude – with a small admixture of contrastive tristesse – a rather lovely Passacaglia, and a terpsichorean and very engaging Toccata finale. To conclude there’s a piece introduced as a bonus, Andrew York’s By Candlelight, a most attractive and sensitive envoi. It brings to an end a splendidly played recital.